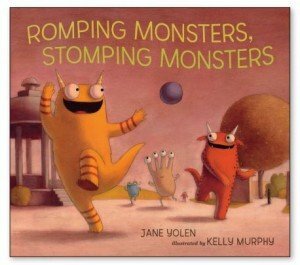 Romping Monsters, Stomping Monsters (Candlewick Press, $14.99, Ages 3-7) by Jane Yolen with illustrations by Kelly Murphy is reviewed by Ronna Mandel. Romping Monsters, Stomping Monsters by Jane Yolen with illustrations by Kelly Murphy, Candlewick Press. I love all the wild and wacky ways illustrators design monsters in children’s books and the monsters in Romping Monsters, Stomping Monsters are just that – wild and wacky! 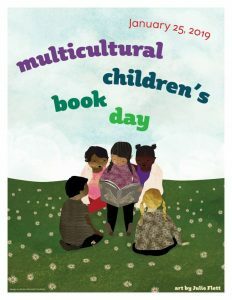 That’s one of the reasons why this picture book works so wonderfully. The other reason is that the combination of Yolen’s rhymes (short, sweet and silly) with Murphy’s humorous artwork had me lingering on every page. This sequel to Creepy Monsters, Sleepy Monsters is packed with every type of monster imaginable, but none to scary to put off a youngster at bedtime. Hanging out in a park (aka Creepy Commons), the assorted monsters in Romping Monsters, Stomping Monsters come in many shapes, sizes and colors. Some have scales, others have tentacles. 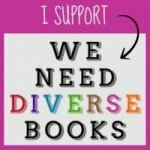 Readers will spot winged, one-eyed, three-eyed, and bulging-eyed monsters. Some monsters are pink, others are purple. I liked the two-legged monsters, but there are also some with four. There’s even a monster with extremely long, stretchy arms, perfect for playing jump rope! What a perfect park Murphy’s envisioned with a lake, fountains, statues, pavilions, and plenty of wide open space for monsters to run around in to their monster hearts’ content. And for a frozen treat when monsters are hot and teeter-tottered out, there’s a monster-sicle vendor. Yolen’s also added a touch of monster mischief around a water fountain, when the bigger sibling of this story goes a bit overboard. But the monster mom insists sibling monsters make up in the end. Does everyone go home from Creepy Commons happy? What do you think? Interior spread from Romping Monsters, Stomping Monsters by Jane Yolen with illustrations by Kelly Murphy, © 2013 Candlewick Press. 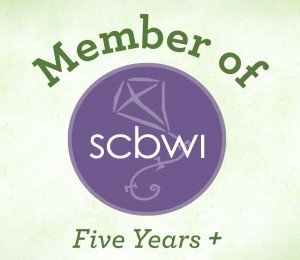 If you are in need of some good, ghoulish tales tonight and tomorrow, take a look at this roundup of recommended reads.